Pedagogy is the "how" of teaching. Together with content knowledge, it forms the core of the body of professional practice. An effective learning environment is one that puts the learning at the centre. It encourages students to become ‘agentic learners’, who are able to monitor, evaluate and optimise their knowledge and skills to become efficient, innovative and creative thinkers and producers. Learning is effective when it takes place in group settings, when students collaborate as an explicit part of the learning environment and when there is a connection to community. By making decisions about the focus of their inquiry and deciding on an outcome that reflects their learning, students develop the key competency of thinking. By conducting research and exploring a range of stories, students develop the key competency of using language, symbols, and text. By establishing inquiry goals, making plans, and managing projects, students develop the key competency of managing self. By recognising differing points of view, negotiating, and sharing ideas, students develop the key competency of relating to others. By sharing their learning with their communities or developing an outcome that can have an impact on their communities, students develop the key competency of participating and contributing. Individual knowledge construction occurs through the process of interaction, negotiation and cooperation. The emotional and cognitive dimensions are inextricably entwined, as such, it is important to be attuned to students’ motivations and the key role of emotions in their learning. Inquiry-based learning and/or project-based learning can be used to support students to become more engaged and/or motivated in their learning. Digital technologies lends itself to a project-based learning approach, one which provides the opportunity for students to be credentialed for their learning from a variety of Digital Technologies achievement standards. A stated intent of The New Zealand Curriculum is to develop students who value innovation, inquiry, and curiosity through encouraging them to think critically, creatively, and reflectively (page 10). Inquiry-based learning aligns well with this intent because it fosters students’ creativity, independence, and problem-solving skills. Throughout the inquiry process, students reflect both on their learning and on the process of inquiry itself. The New Zealand Curriculum gives schools the scope, flexibility, and authority they need to design and shape their curriculum so that teaching and learning is meaningful and beneficial to their particular communities of students. Inquiry-based learning is one way for teachers to respond to the particular needs, interests, and talents of individuals and groups of students in their classes. 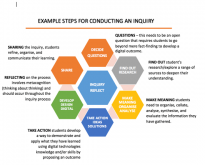 Inquiry-based learning encourages students to move beyond the classroom in their learning and provides scope for them to tackle authentic (real-life) problems within their own communities. This makes their learning both relevant and meaningful. Digital Technologies has connections across all learning areas. Appropriate contexts for learning will be chosen by schools for their relevance and utility. In years 11–13, students work with fewer contexts in greater depth. This requires them to continue to draw fully on learning from other disciplines. For example, students working within electronics will need to refer to science, and students working on a gaming project will find that an understanding of maths is invaluable. Cross-curricular learning ensures that conceptual understanding is gained, is more relevant, and is able to be linked better to other learning areas, ensuring a well-rounded educated student. One of the key strengths of inquiry-based learning is that its starting point involves students identifying areas of personal interest. The process of inquiry is adaptive, and shared decision-making fosters deeper, more authentic learning opportunities. This approach contributes to the development of ako, a teaching and learning relationship in which the teacher and the learner learn from each other. In a reciprocal learning relationship, teachers are not expected to know everything; as the inquiry process unfolds, teachers are taken on a journey of discovery along with their students. An example of an inquiry process is outlined in figure 2. Questions – What is the inquiry focus? This can be provided or decided by the student(s). The focus must allow students to question a broad range of information where they can demonstrate/show their creativity, independent learning, and problem-solving skills. Throughout the inquiry process, students reflect both on the information gathered and on the process they will use to propose a DT outcome that links to the inquiry itself. Share and reflect – Students summarise their findings in relation to the initial inquiry questions(s) and proposed outcome. It may be appropriate to share this information with the community or users that might be interested in their outcome. It is suggested that teachers give consideration to the full suite of Digital Technologies achievement standards when developing their teaching and learning programmes. Demonstrate understanding of human computer interaction 3 Evaluate a range of websites in terms of usability heuristics and suggest improvements by comparing and contrasting related website interfaces. How can we promote better understanding about a teen issue? Students will investigate a teen issue or issues, discuss their ideas with the target audience then develop a proposal to create a website about the teen issue/s. The proposal will take into consideration the environment in which the outcome will be used, the purpose of the outcome, the requirements and specifications of the outcome and the resources needed to create the outcome. The proposal process has an iterative approach which allows the student to fully ‘scope’ out the project and to improve and refine their ideas based on ongoing research and end user feedback. Developing a design for a digital outcome will require the students to apply the knowledge they developed through their research and evaluate a range of websites in terms of usability heuristics. Students will apply their prior knowledge of usability heuristics to develop designs for their website on a teen issue. Students will generate a range of design ideas and use feedback to refine their design. They will select and justify a final design to support the development of a digital media outcome. Develop a digital media outcome requires students to use appropriate tools, techniques and design elements to develop a fit for purpose outcome (i.e. a multi-page website). They will apply an iterative process to develop, test and refine their website to ensure it functions as intended and meets end user requirements. This web design project provides an ideal opportunity for students to demonstrate understanding of compression coding. Students could use their experience of image manipulation and compression to discuss the difference between lossy and lossless compression. Digital technologies is a multidisciplinary subject, which has strong connections with many other learning areas. Opportunities exist for links to be made between Digital technologies and other learning areas and subjects including; the Sciences, Education for sustainability, Social sciences, Mathematics and statistics, Physics and Media studies. Integrated inquiry-based projects can be initiated through Digital Technologies teachers joining with other teachers from other learning areas to jointly plan the learning; or teachers from other learning areas could teach aspects of the integrated project as part of their regular programme.